Why Watch it Today? : King Tut’s sarcophagus was uncovered on this date in 1924. The legend of the curse of Tut’s tomb fascinated the public and fed into cinematic “mummy” movies beginning with 1932’s The Mummy. Curse of the Mummy’s Tomb is interesting as it combines both the approach of that earlier film, with its immortal sorcerer (recalling Sir Arthur Conan Doyle’s short story “The Ring of Thoth“) as well as the approach taken by Universal’s 1940s sequels and Hammer’s own The Mummy, that of the mute, slow but unstoppable mummy that kills its victims one by one (and is generally controlled by one person or another-recalling Sir Arthur’s “Lot 249“). 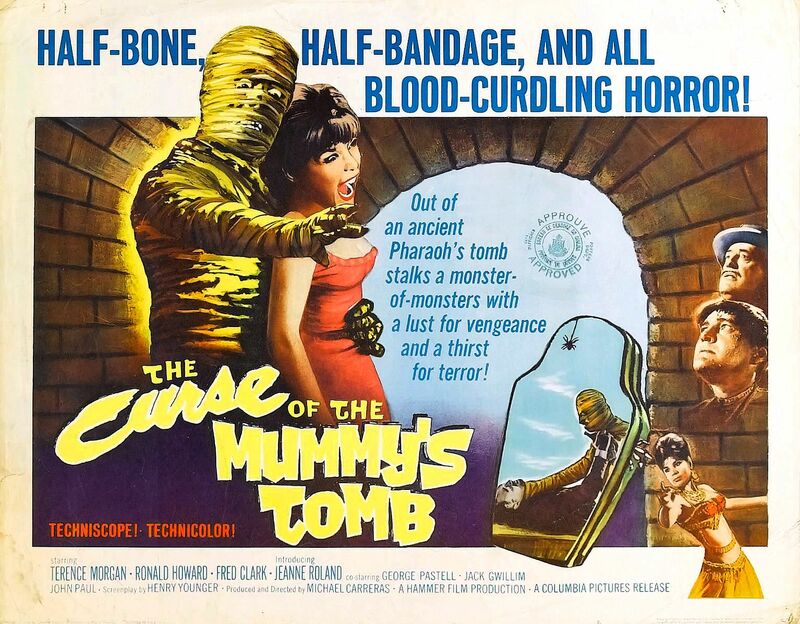 It is interesting to see the two approaches combined, and the mummy himself is quite impressive, and given several strong set pieces, making this worth a look for fans of Hammer and mummies. This entry was posted in Horror, Movie of the Day, Mummy, Thriller and tagged Arab-face, archaeological dig, archaeologist, Britain, Egypt, Egyptians, flashback, Fred Clark, George Pastell, Hammer, Michael Carreras, Michael Ripper, sarcophagus, sewers, sideshow, sorcerer, tomb, ugly Americans.